The invention craze for man-made wave pools is astonishing. Although artificial wave pools are currently widespread, it may still be too early to declare it as an innovation that has come to stay or something that may end up fizzling out. Regardless of this supposition, wave pool prototypes continue to turn up here and there. 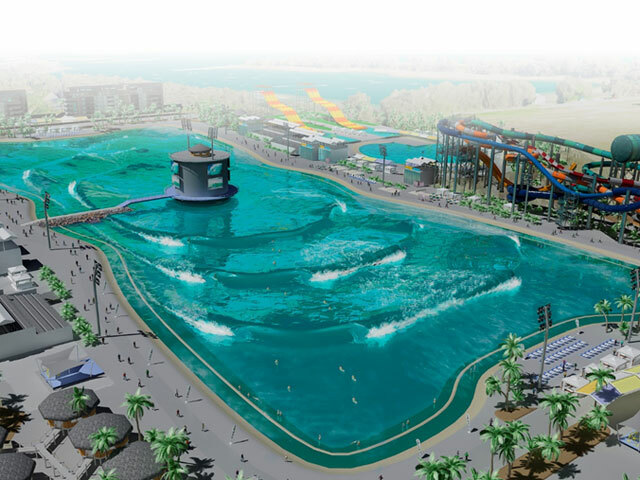 The newest of such artificial wave pools comes from Australia; the center of an emerging wave pool technology. Not too long ago, Surf Lakes Australia announced their intentions to build a facility in North Queensland. The construction of this facility is already underway and according to projections, it is expected to be completed before the end of the year. When completed, the Surf Lakes project will become the first modern wave pool to open in Australia amongst a few other competitors. Artist renditions depict the project looking strikingly different from any other thing seen on the market. It is in no way similar to the Wavegarden’s “The Cove” although, like Slater’s pool and other Wavegarden facilities in Austin, Texas, and Wales, Surf Lakes creation has no central foil generating the wave. This project will have a central tower; this would function as a plunger, radiating the waves throughout the pool, something like a tsunami! According to the creators, this technology is capable of producing 24,000 rides per hour with eight different waves breaking simultaneously! Surf Lakes creation is a stellar project when it is complete; they hope to convince other theme parks to purchase the licensing rights for the technology. However, all this depends on how marketable the technology becomes.